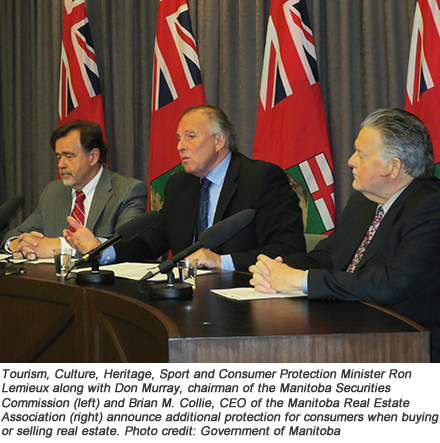 A proposed new Real Estate Services Act will help protect consumers, improve professionalism and accountability throughout the real estate profession, and make for a stronger Manitoba, says Brian M. Collie, CEO of the Manitoba Real Estate Association (MREA). The proposed legislation was tabled yesterday by the provincial minister for consumer protection, Ron Lemieux, for first reading in the Manitoba Legislature. It has been more than 60 years since the Real Estate Brokers Act was revamped. It was first written in the 1940s when people didn’t use smartphones or computers to conduct regular business. Most of the recommendations contained in Bill 70, the proposed Real Estate Services Act, were arrived at following a number of years of careful planning, recommendations, input and cooperative consultation between government and the real estate industry. “We are pleased the Manitoba government is taking this initiative to modernize the act. Many of our recommendations are already implemented and we also look forward to continuing this partnership to ensure that buying and selling homes and properties in Manitoba is a positive community-building experience. Organized real estate is privileged to hold this important role and responsibility. We always want to strengthen the best consumer protection practices and to enhance our profession’s role in building a better Manitoba,” said Brian M. Collie, CEO of MREA. MREA would like to clarify possible misunderstanding around the issue of capping commissions and whether the Manitoba government intends to use its power to enforce commission caps. While the securities commission will have the authority to cap or to amend commissions, the chair of the commission has stressed this authority would only be used if this became an issue in the future and after consultation with the industry and the public. Commissions are not capped in any other region of the country. Commissions are always negotiable and MREA always recommends that commissions be discussed up-front with clients and agreed upon with agents. The code of conduct being proposed within the legislation is a close cousin to the Canadian Real Estate Association’s The REALTOR® Code which is already in place across the country and adopted by The Manitoba Real Estate Association of its own accord. MREA has worked diligently to gain input from a broad cross-section of real estate boards and associations across the country into the code and is fully supportive of the government’s initiative to mandate this code. Currently, the industry’s adoption of the code as a general agreement is voluntarily adopted. The finalized code will call real estate agents to higher standards of professionalism, transparency with clients, and will clearly lay out the responsibilities involved in servicing clients. The addition of a service agreement between agent and seller will also clearly outline the role of the agent and will set forth a written agreement covering commissions, fees, and what services the agent will provide. “It will place a higher level of expectation on practitioners in the real estate industry, and I think it’s a good thing for all,” Collie said. The service agreement is a change welcomed readily by The Manitoba Real Estate Association, which represents nearly 2100 real estate professionals across the province. Under the proposed act, homebuyers and home sellers will also be able to check for timely information – likely to be posted on the Manitoba Securities Commission site – for a listing of real estate agents who have been disciplined in order to know the status of complaints filed. Yesterday’s Winnipeg Free Press article by Larry Kusch correctly outlined some of the changes expected with the proposed act, which could likely take effect in early 2015. Boost maximum fines to $100,000 for agents and $500,000 for brokerages from the current $1,000 for agents and $2,000 for brokerages. Agents could also face up to two years in jail for breaching the act. View Bill 70 in its entirety or read the Province of Manitoba’s media release.